Plants cespitose, not rhizomatous, sometimes glaucous, especially in the spikes. 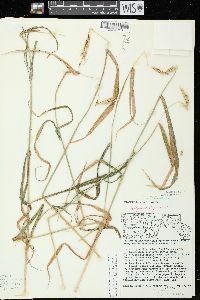 Culms 30-130 cm, erect to slightly decumbent; nodes 4-9, concealed or exposed, usually glabrous, rarely pubescent. 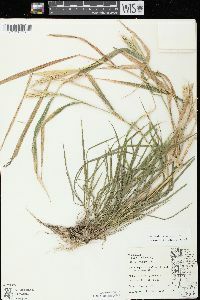 Leaves evenly distributed; sheaths usually glabrous, rarely hirsute, occasionally reddish or purplish; auricles absent or to 1.8 mm, pale brown; ligules shorter than 1 mm; blades 2-14(18) mm wide, usually spreading or lax, sometimes becoming involute, basal blades similar to the upper blades, adaxial surfaces usually smooth , sometimes scabridulous, usually glabrous, occasionally pubescent. Spikes (3)4-16(22) cm long, 1-2.2(2.5) cm wide, erect, the bases often sheathed, with 2 spikelets per node, rarely with 3 at some nodes; internodes 3-5 mm long, 0.25-0.5 thick at the thinnest sections, smooth and glabrous, or scabrous, or with hairs beneath the spikelets. Spikelets 10-15 mm, appressed to slightly divergent, with (2)3-4(6) florets, lowest florets functional; disarticulation below the glumes and each floret, or the lowest floret often falling with the glumes. 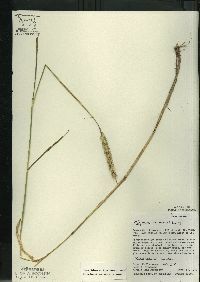 Glumes subequal or equal, the basal 1-4 mm terete, indurate, without evident venation, bowed out, yellowish, glume bodies 7-15 mm long, (0.5)0.7-2.3 mm wide, linear-lanceolate, widening above the base, 3-5(8)-veined, usually smooth or scabridulous, margins firm, awns 3-10(15) mm, straight; lemmas 6-10 mm, scabridulous, glabrous or villous-hirsute, awns (5)8-20(25) mm, straight; paleas 5-9 mm, obtuse; anthers 2-3.5(4) mm. 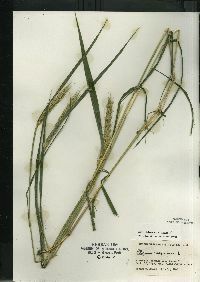 Anthesis usually mid-June to late July (mid-August). 2n = 28. 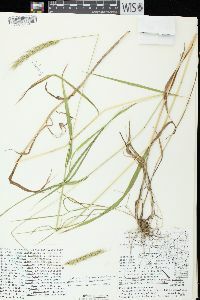 Elymus virginicus is widespread in temperate North America, growing as far west as British Columbia and Arizona. It is infrequent to rare in the Rocky Mountains, western Great Plains, and southeastern coastal plain. 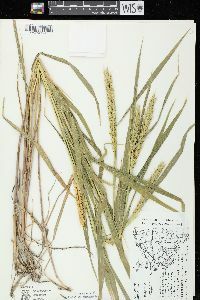 It is a complex species, divided here into four intergrading varieties. 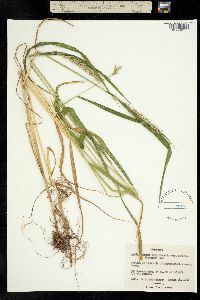 Tufted perennial 5-12 dm; lvs mostly 6-10 per stem, flat, 4-10 mm wide, scabrous on both sides; auricles to 1 mm, or wanting; spikes rigidly erect, 4-12(-16) cm, the base often included in the summit of the ±inflated uppermost sheath; spikelets mostly paired, 2-4(-5)-fld, disarticulating below the glumes; glumes subequal, 10-30 mm overall, firm, 0.8-2 mm wide, with a yellowish, cartilaginous, bowed-out base 1+ mm exposing the subtended florets, expanded above the base and tapering to the tip, flat and with 2-3 ciliolate veins abaxially, but swollen and uninerved for at least the basal half adaxially, usually ±long-awned, to 4 cm overall; lemmas small, 6-9 mm, glabrous to crisp-puberulent, scabrous and becoming 5-veined above the middle, usually with a long straight awn to 3.5 cm, but sometimes virtually awnless; larger paleas 6.5-8.5 mm, obtuse to truncate or slightly emarginate; anthers 1.5-3 mm; 2n=28. Moist woods, meadows, and prairies; Nf. to Alta., s. to Fla. and Ariz. Highly variable, and often divided into a number of ±sympatric, intergrading vars. or forms. 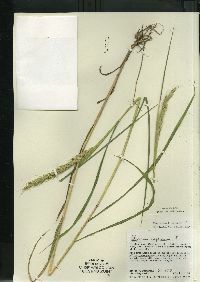 A hybrid with Hordeum jubatum has been called ؅lyhordeum montanense (Scribn.) Bowden.